Con la Capilla del Sol (grupo que dirijo) nos presentamos el 18 de mayo en el Ciclo de Conciertos Pilar Golf estrenando nuestro programa "Vengan a la fiesta" (música de los conventos femeninos de la América Colonial). Hace unos días publiqué la crítica que escribió Margarita Pollini para Ámbito Financiero, hoy posteo a continuación el texto de la nota de Pablo Bardin para el Buenos Aires Herald. La crítica es "compartida", ya que se refiere a nuestro concierto y en los párrafos finales reseña también una presentación de la Academia Bach de Buenos Aires (para demarcar claramente cada sección, cambié el color de la tipografía en la sección que habla de la Academia). ah! es en inglés (lo lamento por aquellos que no comprendan el texto). No matter the final result of the concert, I always welcome enterprise in programming, for it involves risk, considering the intellectual laziness of a high percentage of the audiences. So organisations and artists that do pioneering work in making known valuable but neglected repertoires have my sympathy and support. “Our” Ramiro Albino, who prepares weekly his column Critic´s Choice for the Herald, is an expert on the Baroque, and ten years ago he founded at the Museo Fernández Blanco Capilla del Sol, a vocal-instrumental ensemble fully dedicated to Latin-American Baroque. It wouldn´t be possible without the intelligent and sensitive work of the Museum´s Director, Jorge Cometti, and of the Musical Coordinator Leila Makarius. They fully understand the cultural weight and contribution to the diffusion of this music that Capilla del Sol symbolizes. The group has made two CDs and is waiting for the money to record as a third CD precisely what we heard in the concert I am reviewing: “Vengan a la Fiesta” (“Come to the Feast or Celebration”): Music of the women´s convents of Colonial America. For one reason or another last year I couldn´t attend any of the concerts of the Conciertos Pilar Golf subscription series. Now in their ninth season, they offer eight concerts programmed and presented by Graciela Nobilo. Although I feel that the total programming veers a bit too much to crossover, most of what they offer give those that either live in Pilar or have weekend houses at the countries of the area a stimulating night of music, generally with well-chosen artists. It´s worth doing the hour trip from our city to attend these concerts. In this case they plunged into the unknown with Capilla del Sol´s two-part programme, presented with vehement enthusiasm by Albino. As it is a newly concocted project, I surmise that all was heard as a premiere. Part I, “The Mass”, centered on a “Misa a duo y bajo de la escoleta (school) de Bethlehem (Colegio de San Miguel, Belén, México) by Mariano Soberanis; this rather beautiful music similar to contemporary eighteenth-century Spanish masses was heard interspersed with Verses for organ (short pieces usually in fugal style played between parts of a mass) by Marcos Vega and Anonymous from Belén and Puebla. 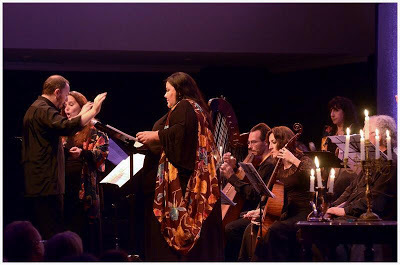 The First Part ended with “Con suavidad de voces” by the Mexican Juan de Vaeza, a “chansoneta” (“canzonet”) to accompany the profession of “Theresica la chiquita”, who entered a Puebla convent. The Second Part was “La Fiesta”, for there was festive music in the convents. We had a varied panorama. Three anonymous pieces from the Guatemalan Convent of Santa Eulalia: a charming “Pabanilla” (short pavan) for recorder, finely played by Albino; and two vocal pieces, “María de solo un buelo” (orthography was different then) and “Oy hazemos fiesta todas”, very spry. Then, a Bogotá seventeenth-century “villancico de negros”, for indeed black people had their own Christian music (I suppose there were black nuns). An unannounced piece for two voices took the place of another that was in the hand programme. Then, “Para divertir al niño” (a reference to the infant Christ) by the Lima composer Eustaquio Franco Rebollo. And finally, “Oygan, escuchen, atiendan” by Manuel de Mesa y Carrizo, from Sucre´s National Archive, a “jacarilla” (short “jácara”, a tune for singing and dancing) for the Conception of Our Lady. Charming, joyful music, with a popular feeling. In this particular instance Capilla del Sol was integrated by four sopranos, two contraltos and six players. Although there were a few vocal discordances and the organ playing wasn´t completely accurate, the spirit of the music was strongly communicated. Albino´s arduous work of finding the materials and infusing them with life was admirable. Some of the sources were provided by such illustrious musicologist friends of mine as Waldemar Axel Roldán and Diana Fernández Calvo. An excellent interview of Albino by Daniel Varacalli Costas gave first-rate information in the hand programme. Once a year the Academia Bach occupies for two nights the wonderful main hall of the Museo Larreta, with its ideal intimate ambience and acoustics for the Baroque. This time our best young cellist, José Araujo, gave a recital accompanied by harpsichordist Matías Targhetta. The programme followed the central idea of this year´s cycle: Bach and the Dresden Court. From Johann Sebastian, two important works: the “Italian Concerto”, played correctly rather than brilliantly by Targhetta; and the very difficult Suite Nº 6, where Araujo gave us good work, with manly, true sound and clean articulation; some small smudges made no serious dent on his accomplishment. This Suite has the added problem of having been written for a five-stringed “viola pomposa”, an instrument similar to the cello but with an ampler range of three octaves; to play it in the four-stringed cello is quite a feat. The other pieces were by Italians that worked at or for the Dresden Court. Francesco Veracini´s “Overture and aria” for cello and continuo (harpsichord) was interesting and chromatic, though it´s a pity that in a programme of the Academy we heard a transcription rather than an original. From Nicola Porpora, a beautiful Sonata in F por cello and continuo in the “da chiesa” mold (slow-fast-slow-fast). And from Vivaldi, a Sonata of the same type in A minor, RV 43. All this music was finely played, with taste and style, by the artists. The presentation was, as usual, by Mario Videla.